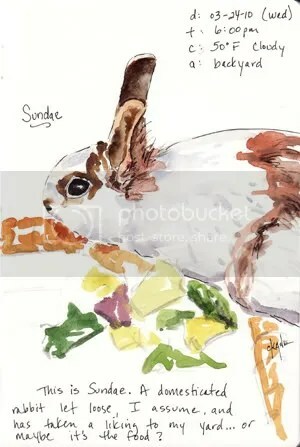 Visiting Bunny Sketch – Let's Paint Nature! I have a new visitor in my backyard. For the last week, a newly released domesticated rabbit has taken residence in my yard. I am kind of happy…I love fluffy bunny. 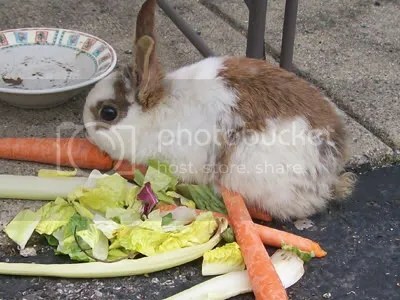 Everyday when I come home from work, I proceed to the backyard baring gifts of carrot, celery, and lettuce. After many days, this bunny actually runs up to me now, when he sees a carrot (his favorite) in my hand. I wanted to name him, “Chocolate Sundae” (can you tell I have ice cream on the mind?) but my husband said that’s too many words…so his name is Sundae. He looks like a giant mound of vanilla ice cream with wonderful toppings of chocolate and caramel. Yummmm. Here is the actual photo. I was thinking of finding a cage and really taking care of him but decided not to as I already have too many responsibilities. I’m sorry somebody let him go, he’s such a charmer, but I will help feed him because he has won my heart. Oh how cute. Just in time for Easter! I like your sketch. Surely he must think he is in heaven to have such a selection of food to eat. His name fits for sure. I wonder what his feathered friends think? Maybe he’s lost? Poor little guy. You’re taking good care of him, at least. Lana: Unfortunately, my bunny friend disappeared as fast as he appeared. I am not sad though, I am thankfull for the time I had with him.